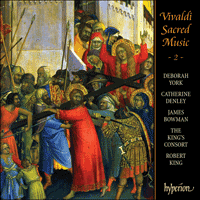 The first volume of The King's Consort's exploration of Vivaldi's sacred music featured some of the composer's most opulent church writing, with works requiring double choir and two orchestras. The second volurne turns to smaller-scale, solo-voice motets, featuring six contrasting works that were written with a variety of different soloists in mind. Seeing the technical skills which the composer frequently demands of his soloists (for example, the extraordinary bird-like warbles in the first aria of Canta in prato or the vivid representation of Satan's wiles in Nulla in mundo), one can only marvel at the abilities of singers in Vivaldi's day. Here was a composer who was wonderfully individual, testing both musical forms and his singers to the utmost, writing music of great life and spirit which is immediately approachable for performers and listeners.